The ultimate must-have guide for identifying migrant raptors, Hawks at a Distance is the first volume to focus on distant raptors as they are truly seen in the field. Jerry Liguori, a leading expert on North American raptors, factors in new information and approaches for identifying twenty-nine species of raptor in various lighting situations and settings. The field guide's nineteen full-color portraits, 558 color photos, and 896 black-and-white images portray shapes and plumages for each species from all angles. Useful flight identification criteria are provided and the accompanying text discusses all aspects of in-flight hawk identification, including flight style and behavior. Concentrating on features that are genuinely observable at a distance, this concise and practical field guide is ideal for any aspiring or experienced hawk enthusiast. 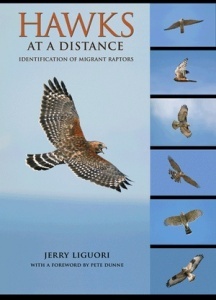 Jerry Liguori has been studying raptors throughout North America since 1984. He has conducted hawk migration counts at spring and fall migration sites, such as Cape May Point, Sandy Hook, Derby Hill, Braddock Bay, Whitefish Point, and Dinosaur Ridge, and the Goshute, Wasatch, and Sandia mountains. He is the author of Hawks from Every Angle (Princeton). 'A remarkable and important field guide.' - Greg Laden, Science blogs.